Does your yard provide good habitat for wildlife? Although my town has acres of wild land and most of us here have seen wild animals roaming through our yards, nationwide 6,000 acres of wild land are being lost every day to development. As humans move in, most wildlife is forced to move out and unfortunately, sometimes they have nowhere to go and perish. One example is the Monarch butterfly. Habitat destruction along its migratory route has impacted its numbers critically. Scientists estimate they’ve declined 90%. It saddens me to think of the world without this splendid creature which evolved a complex survival strategy over thousands of years. Migration is rare in the insect world. Every autumn, adult Monarchs born that summer in northern states fly 2000 miles along migration corridors to wintering grounds in Florida, Mexico and southern California. 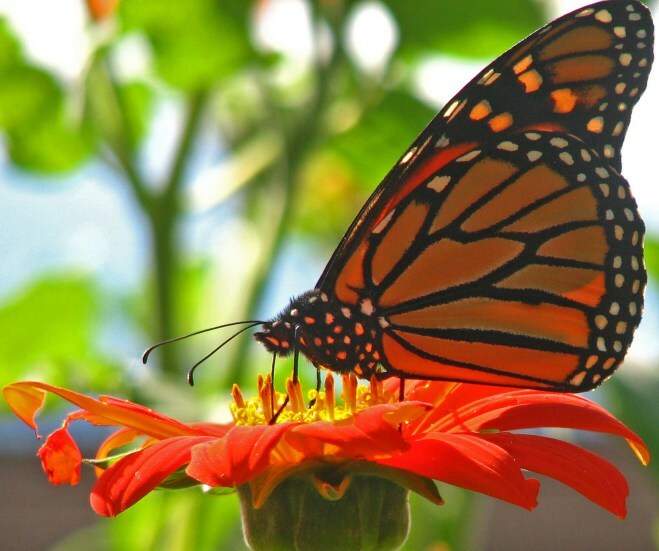 In spring, Monarchs fly north a few hundred miles, breed, lay eggs on Milkweed, then die. Their larva feed, pupate and emerge as adults to continue the journey taking four generations en route to reach summering grounds. Since Milkweed is considered a noxious weed and poisonous to livestock, farmers have launched a very successful campaign to eradicate it from their fields. Milkweed is no match for Roundup. Monarch larvae feed only on Milkweed. No Milkweed, no Monarchs. The survival of the Monarch is in the hands of people like you and me all along their migratory route. If you have friends or family in any state in the continental U.S., urge them to plant Milkweed. Put up educational posters, contact your local newspapers and agricultural representatives. Support the creation of mow-free areas of Milkweed along the interstate highways and public land. Teachers, along with students and parents can create Monarch gardens at schools and recreational areas. Urge farmers to allow swaths of wild land along their borders that include Milkweed. Our collective action in the next few years will determine the survival of this critically declining species. Devote a large section of your yard to several species of Milkweed (Asclepias tuberosa, A. syriaca and A. incarnata) for larva as well as nectar plants for adults such as Indian Blanket (Gaillardia pulchella), Purple Coneflower (Echinacea purpurea), Joe Pye Weed (Eupatorium purpureum), Scarlet Sage (Salvia coccinea), Mexican Sunflower (Tithonia sp.) and Zinnia, ‘Dahlia Mix’ (Zinnia elegans). For more information on how you can make a difference, check out www.monarchwatch.org. They offer ‘Monarch Waystation’ seed kits that consist of nine packets of the above species along with planting and care instructions. The need is urgent and I implore you to take action now before this marvelous species vanishes from the earth forever. This entry was posted in Country Gardening, My Photos and tagged conservation, gardening, habitat, habitat loss, habitat restoration, monarch butterfly, nature photography, threatened species, wildflowers. Bookmark the permalink. I love this posting Eliza. You made it very informative but not overwhelming. I always take hope from your postings that there are small things I can do to help the environment/wildlife in my area. It is amazing how easy it is to pick up the phone and organize something. I’ve called four people and we’re going to plant at least two gardens here in town and two homeschoolers want to do a public education project at local supermarkets, sponsors are popping up. “Providence moves…” If everyone did just one little thing, imagine the cascade of events! I just cleared a section of my property and it does have some milkweed in it,but after reading this post I am planning to add more milkweed this summer! Great research + well done post Eliza:-) I also wonder if we all should make seed bombs of milkweed and engage in some throwing of our little milkweed bombs:-) I do see milkweed on my bike ride along the Mississippi River:-), but we need more. 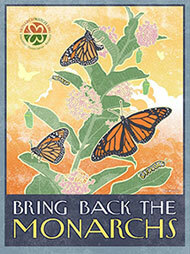 I want to see more monarchs and the past few years I have seen fewer:-( , so we need to get planting! I agree! Milkweed bombs – LOL! I love the idea of spreading seeds – I do that a lot! Vacant lots, places where they are not likely to get mowed down. Wildflowers beautify the world and spread joy! Fantastic post! This is an important issue that people need to know about. Thank you for posting about it. Thank you, Jackie. Please spread the word or even reblog, the more people who know about this, the better! I love both Monarchs and Milkweed, and I didn’t know about all of that. Thank you for sharing this information Eliza, I will do my best to spread the word. Thank you, yes, it is all hands on deck! in case you get a chance to see it. It’s done with IMAX 3D technology and projected onto a dome; it’s a marvel of a film. It’s the story of Dr. Fred Urquhart. Ooh, I would love to see that! Thanks for the link! I have quite a bit of orange milkweed in my garden, but struggle to keep the swamp milkweed wet enough. But I’m adding some to my rain garden this spring. I saw a few monarchs last year and only had a few caterpillars. Very sad. Thanks for reminding everyone how important milkweed is! Every little bit helps, the more we all can do, the better the chance that together we can make a difference. Thanks for stopping by and commenting!